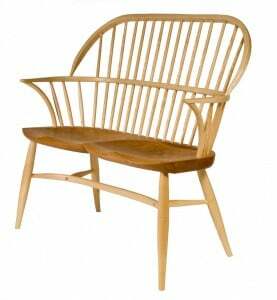 Chair Making Courses: settee, continuous-arm…. and now Crown Windsor! 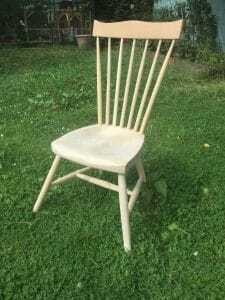 Autumn is here and I am back in the swing of chair making courses after a couple of busy months doing other things. 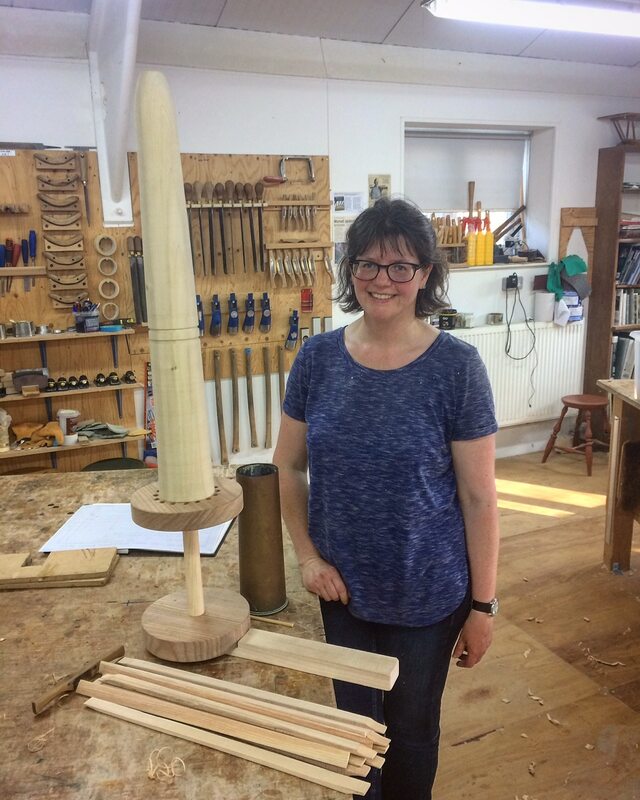 I include a number of brief sections, including: new course dates; upcoming shows (free tickets to download for Sussex Guild show at Midhurst); travisher and spokeshave news; a new chair; reports of chairs made by past students; and finally Mary Crabb and her WW1 shell baskets. Hopefully you will find things of interest! On my website you will now find courses through to the beginning of July 2017. I have never planned so far in advance before and hope I am not tempting fate! All the usual chairs and stool are available, but I’d like to draw your attention to two that are less familiar. For those that have been before and can work quickly there is a settee course on 14-18 November. 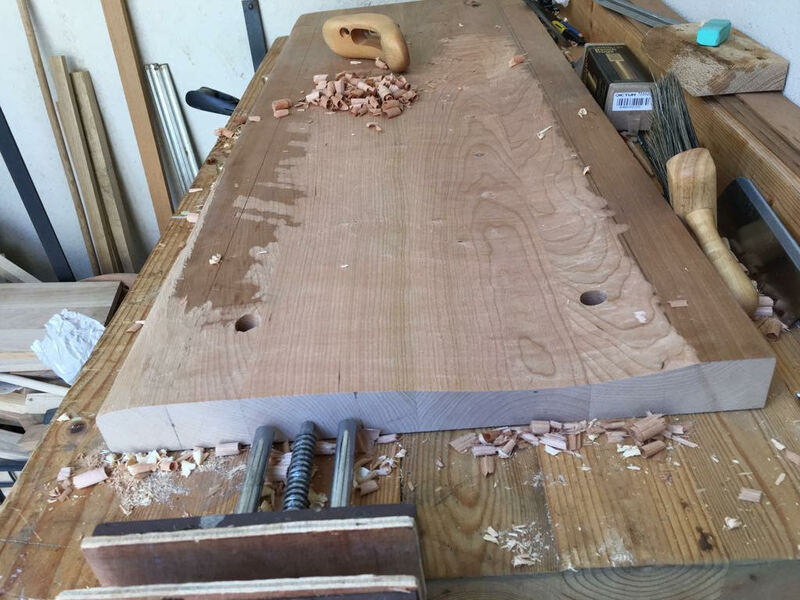 This is one of my favourite courses, busy from the beginning with 4 bends for each piece! If you have a spot in your house suitable for a compact 2-seater, this is your chance to make it! It will be at least another 12 months before I repeat this course. For something completely new, come and make my Crown Windsor on 13-17 March next year. 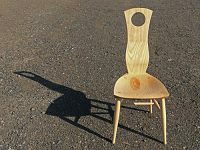 It is a wide chair and virtually everyone that has sat on it says that it is very comfortable, because of the steam bent splat. This is definitely a relaxing chair. I think of it as ideal for reading the newspapers over the weekend. It is not designed for use at a table. 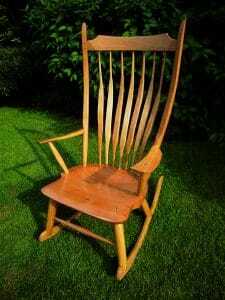 Although it is quite a big chair, it is relatively simple to make and would be suitable for those with, and without, previous experience. I did this show for the first time last year and it has been moved a month later this year. This is a commercial show, run by the same organisation as the excellent Wisley spring show. There will be an extensive range of fine crafts to be seen. This is always a superb show in the run up to Christmas and has become the largest event in the Guild’s calendar. I am helping to run it this year, so hope it will be as good as ever!! For free tickets, click here to download! 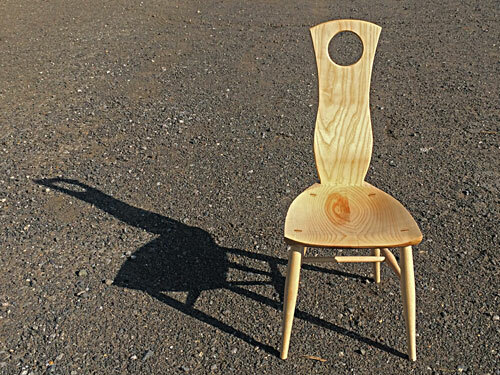 Having taken the Crown Windsor to several shows and had it seen and sat on by many students, I thought I would develop the idea of using a steam back splat – this time in a compact side chair. This is the result. At present it doesn’t have a name, so if you are inspired to give it a moniker, please let me know. I’d be most grateful! This is version #2 and I think there is one more iteration required before the design is absolutely settled. All that will be changed is the front of the seat, which will come up to a point in the middle. 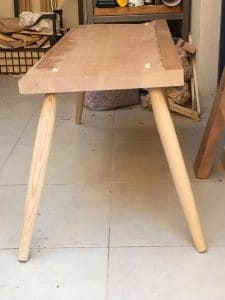 The back seems to be very strong, thanks to the strut which is dovetailed into the seat, and like the Crown is very comfortable. So far it has been well received. Once I have made the definitive version I will include it in a newsletter. I believe that it could be made on a 4-day course. Do let me know if this is of any interest (no commitments either way at this stage!). 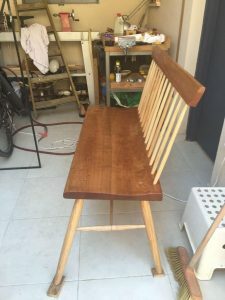 My summer has turned out quite differently from how I planned it, thanks to an article in Fine Woodworking which extolled the virtues of my travisher! I had been warned about 18 months ago that an article might appear, but with such a long interval I had begun to doubt that it would ever appear. I was on holiday at the end of July when my email lit up with orders, almost all from the USA. They have quietened down now, but over about six weeks I made and sold about a year’s worth of tools!! 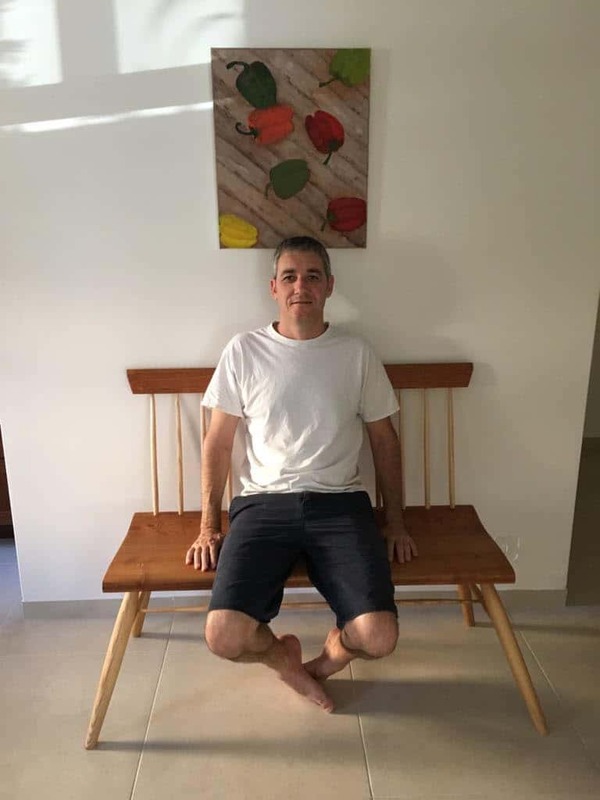 Thank you Fine Woodworking and Fabian Fisher, the author. I must also thank Ben Orford for keeping up with demand for the excellent blades which he forges for me. At least I have been doing my bit for the balance of payments. The fall in the pound has certainly made my tools very competitive abroad! 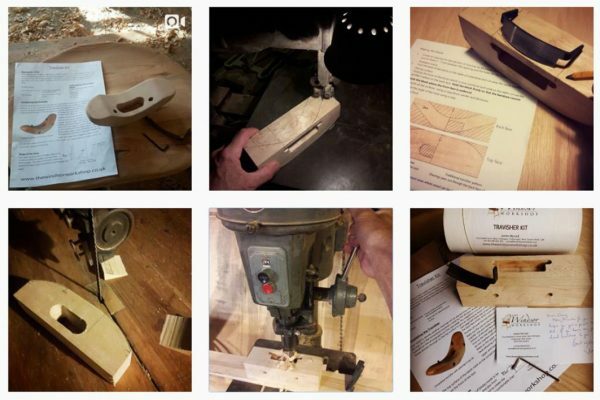 Craig Regan, known as ‘seatsculpter’ on Instagram has recently posted a set of pictures showing the key processes involved in making a travisher from one of my kits. Craig’s resulting tool looks great and his images are very clear. 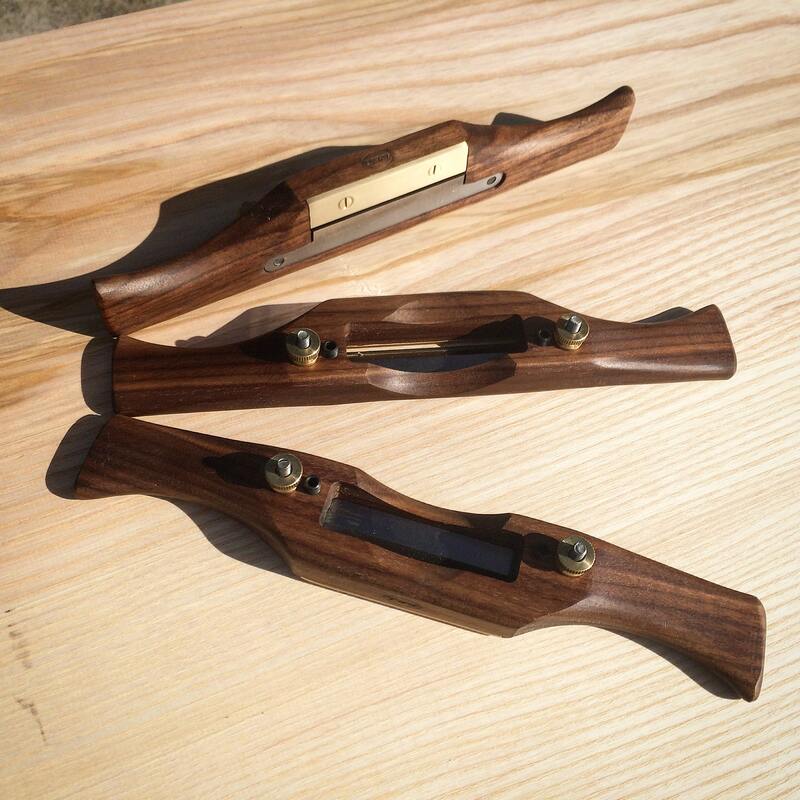 I have put them on my website for aspiring tool makers to see. Thank you Craig! After many years of making all my tools in hard maple, I finally branched out and have used black walnut and lacewood as variations for the medium spokeshave. Both look great, but my favourite must be the walnut. The colour goes with the brass fittings so well! 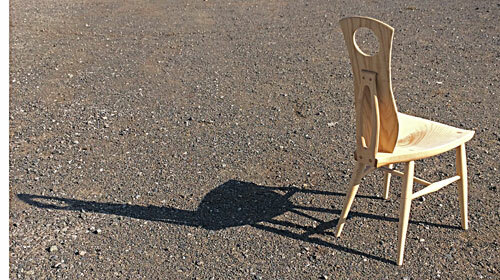 If you would like one of them, please order in the usual way and then email me with your wood preference. For the time being the price will be the same for all woods, though I can’t promise that this will not change in the future. 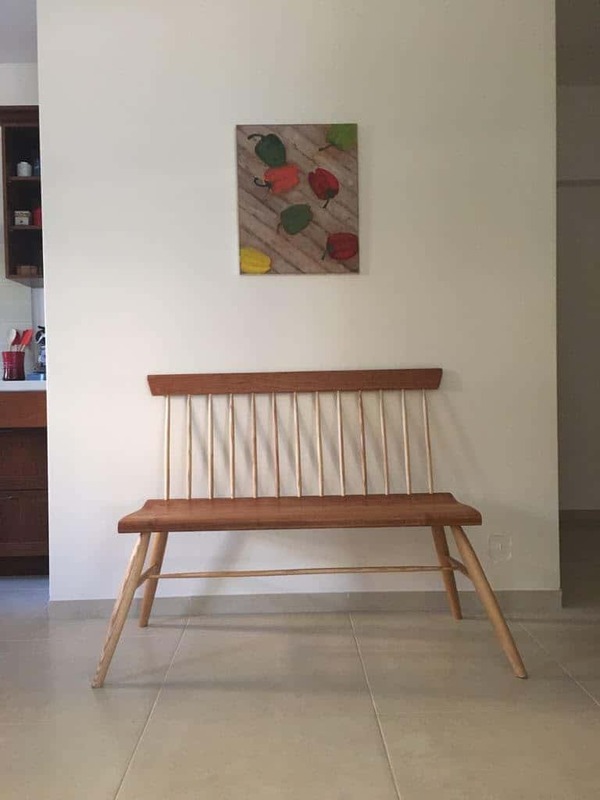 I have recently received emails from a number of past students including photos of their work. 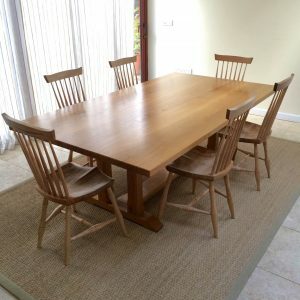 It is so exciting to me to see what is produced at home following one or more courses at The Windsor Workshop. 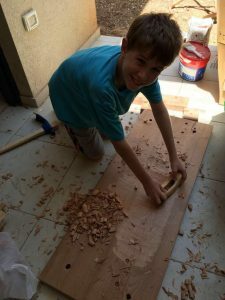 I’m sure you will agree that there is some great work being done! Charlie came on a course with his son back in 2014. He has been very productive since then. In a previous newsletter I included a picture of his 4 bow back. 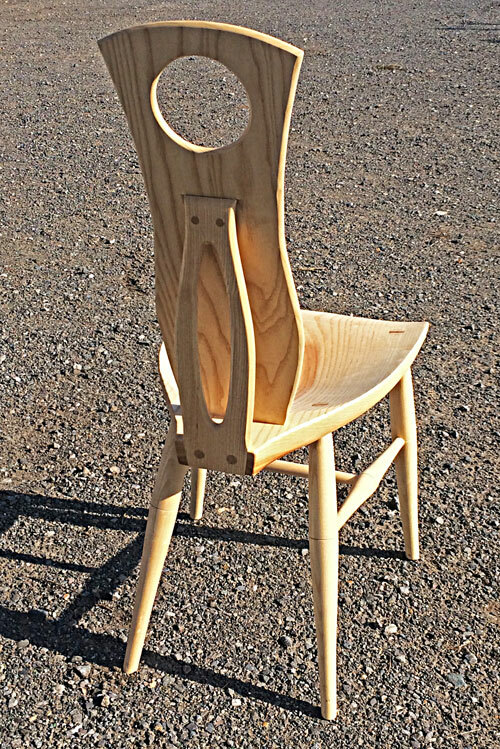 He has now finished a rocking chair – Peter Galbert’s excellent design I think. 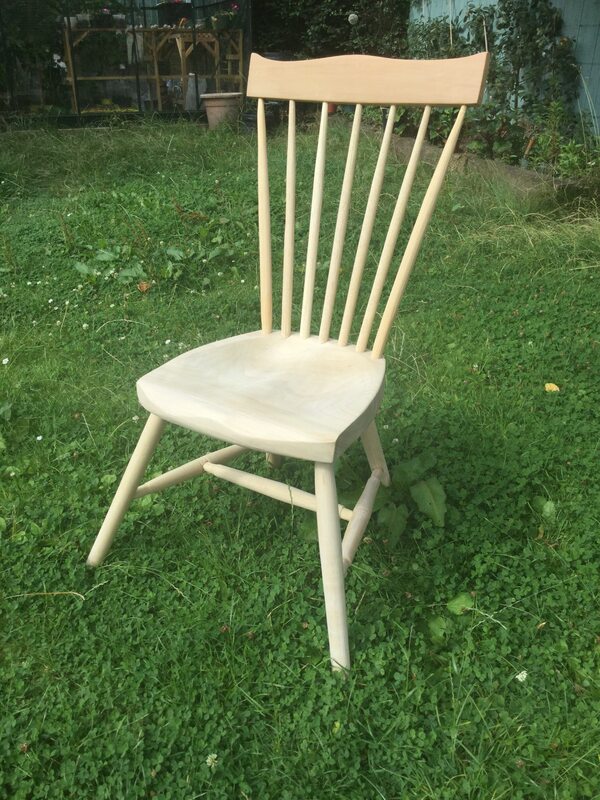 Ian came on a course earlier this year and has just completed his first chair on his own. He also sent me a picture of an amazing row of sack backs from Mount Vernon – home of George Washington. 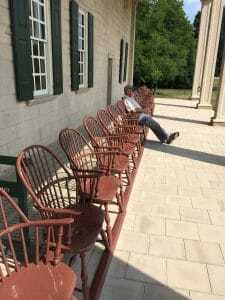 I have been there, so have almost certainly seen them, but it was before I had been bitten by the Windsor chair bug, and so don’t remember them. If you have a long veranda and are a keen maker, this would be a major project for you…..! Erez came on a course at the beginning of this year to make a sack back. His first challenge was to get the chair home with him on the plane and that was successful having wrapped it very thoroughly in bubble wrap and cling film. As there is no green wood available in Israel, Erez could not use exactly the same techniques, but he has just completed a charming Windsor bench made entirely from dry wood. Phil has completed 6 comb backs since attending a course in 2014. He has 4 more to go! Phil is by nature more of a straight-line/right-angle man, but has taken to the rather different nature of Windsor chairs with great success! Mary Crabb with her turned shell former standing on its base with shaved splints on the bench. 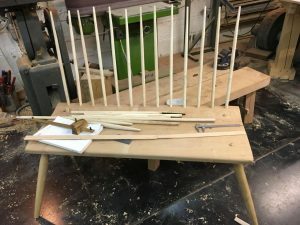 “A couple of weeks ago I joined James for a day at the The Windsor Workshop to assist me with a project I’m working on. In the past year I have been researching objects relating to my Grandmother’s boyfriend, killed in France in 1916, with the aim of creating a collection of work incorporating facts and figures relating to their story. I’m a basketmaker and my work makes connections between traditional/contemporary basketry and textiles. As part of my research I visited the Museum of English Rural Life (MERL) to view a WW1 artillery shell basket in their collection. Shell baskets were used to transport shells to the Front either in a limber, behind a gun carriage or on horseback. My enquiry led me to become part of a project specifically researching basketry in the First World War, set up by the Every Day Lives in War Engagement Centre University of Hertfordshire and is funded by the Arts and Humanities Council. The focus of my work at the moment is to weave a replica of the shell basket in the collection at the (MERL). The shell basket was woven in cane and willow around a wooden former, presumably made to match the dimensions of the shell. It has four wooden splints running up the side of it. The make is proving to be quite a challenge as I’m going to have to work much larger scale than I am used to, weaving with a type of cane, Kooboo, that I am not familiar with. Before weaving with the cane, I have to split it lengthways. This is a long process, done by hand, splitting with a knife before scraping the sharp edges. As I’ve already discovered, it’s a tricky material, that’s very hard on the hands and the process is very slow. Following weaving I need to add a leather cuff to the wide open end of the basket. I requested the assistance of James to enable me, with his instruction, to turn a former using the lathe and shape the wooden splints using hand tools. 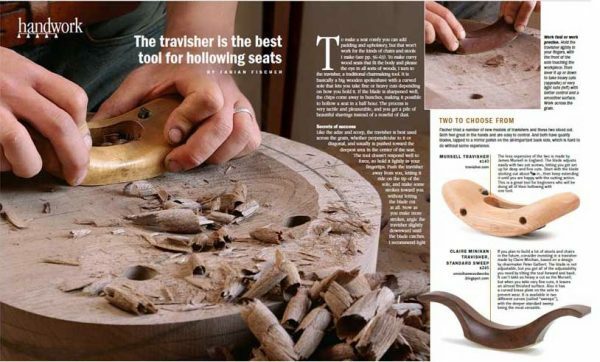 Although I had used a lathe before, as a child, I had never used one for turning. I really enjoyed the process, and learnt a great deal in a short space of time. As I mostly weave with metal wire and fine flexible threads, handling wood was a change, but most interesting. Working from a design I had drawn up, James also produced a stand for setting the former on.